It was a month of celebrations for Balya Bibaha Pratirodh Manch, Kandhamal (Odisha). On October 24, the Manch celebrated its first annual day at Phulbani, District Kandhamal. More than 200 people participated in the programme, including the young campaigners against child marriage; District Child Protection Officer, Phulbani; Sub-Collector, Phulbani; anganwadi workers; and representatives from the civil society. ActionAid India, along with its ally, Antaranga, had, two years ago, facilitated the formation of this community-based platform; it comprises adolescent girls and boys who have said no to child marriage. The programme witnessed rich discussions on the root causes of child marriage, its consequences and the strategies to prevent it, including girls’ education. Bishnupriya, Secretary, Kandhamal Balya Bibaha Pratirodh Manch, shared that as a result of their continued efforts, they have been able to stop nearly 60 child marriages so far. Well, the celebrations did not end there! 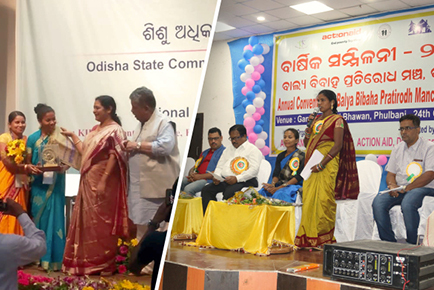 On November 1, the Odisha State Commission for Protection of Child Rights felicitated Balya Bibaha Pratirodh Manch, Kandhamal for its rich contribution towards stopping child marriages in the district. In addition, as a result of continued advocacy, the government of Odisha has recently constituted a committee on child marriage. We are pleased to share that a colleague from ActionAid India’s Odisha Regional Office has been nominated as a member of this committee. Going forward, we remain committed to deepening our engagement further on the rights of children from marginalized communities, building their leadership and empowering them to address their issues.